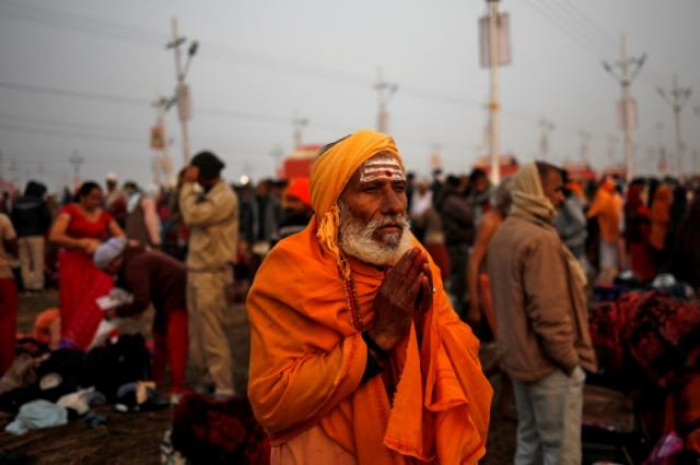 Pilgrims from across the world are gathering in India for the Kumbh Mela, a heady mix of spirituality, politics and tourism that begins on Tuesday, garnering extra attention ahead of a general election in the Hindu-majority country this year. During the eight-week festival at Prayagraj in the northern state of Uttar Pradesh, authorities here expect up to 150 million people, including a million foreign visitors, to bathe at the confluence of the Ganges, the Yamuna, and a mythical third river, the Saraswati. Devout Hindus believe that bathing in the waters of the Ganges absolves people of sins and bathing at the time of the Kumbh Mela, or the “festival of the pot”, brings salvation from the cycle of life and death. “Kumbh is a conglomeration of spiritual consciousness and cultural heritage,” Mahesh Sharma, who heads the culture ministry, said in a statement. On Tuesday millions of pilgrims, led by naked, ash-smeared ascetics, some of whom live in caves, will plunge themselves into the icy waters during the first Shahi Snan, or Royal Bath, that begins around 4 a.m. (2230 GMT). With less than 24 hours until the festival starts, the last of the arriving ascetics paraded towards temporary ashrams, or monasteries, built of corrugated steel and canvas on the eastern banks of the Ganges, many decked in fairy lights. Pilgrims poured in to the site, which is closed to traffic around bathing days, carrying bundles on their heads, while vendors peddled neon balloons and cotton candy, as securitymen stood guard, with priests and armed police seated side-by-side. Authorities have set up temporary bridges, 600 mass kitchens and more than 100,000 portable toilets in a pop-up city at the confluence of the rivers, which is known as the sangam. Those with cash can make their pick of luxury campsites on the river banks that offer ayurvedic spas and yoga that cost up to 32,000 rupees ($454.09) each night. Most of the pilgrims make do with more modest lodgings, sleeping in vast tents or out in the open. “I don’t know where I will stay yet, but you do not often get to meet these saints and sadhus,” said Rajendra Singh, a retired soldier now working as a security guard, who rode a bus from the state capital, Lucknow, about 200 km (124 miles) away. This year’s event comes at a critical time for Modi’s Hindu nationalist Bharatiya Janata Party (BJP), expected to face a tough contest in a general election due to be held by May. It lost power in three key states in assembly elections in December, and will want to avoid a similar result during the general election in Uttar Pradesh, a state of 220 million where a good showing can often decide the contest. The state’s chief minister, Yogi Adityanath, is a firebrand Hindu monk from the BJP, who has championed policies that play to the party’s core Hindu base. This year Adityanath has transformed a smaller Ardh, or “half” Kumbh Mela, into a full version of the festival. He has also lobbied for a controversial Hindu temple on the site of a former mosque, and renamed several cities - including Prayagraj, which used to be known as Allahabad until it got its new name in October. Modi and his rival, opposition Congress leader Rahul Gandhi, are both expected to attend the festival before it wraps up in March. If you have a story you think we might be interested to know about please email our news team at [email protected]ail.com or phone +994 125975052 and ask to be put through to AzVision.